Power-ups are items that can be picked up by Mega Man. Some can be found in specific locations of each level. When an enemy is destroyed, it has a small chance of dropping any of these power-ups, except for E-Tanks. Throughout Mega Man's efforts to bring Dr. Wily's robots down, he will be under attack and sustain damage from time to time. These capsules will refuel his power cells and restore any lost energy. A small capsule restores 2 units, while a large one restores 10 units. Whenever Mega Man fires a weapon that he obtains from another Robot Master, he uses up some of that weapon's power. He can restore that power by collecting a weapon capsule, but he must be using the weapon he wishes to restore. A small capsule restores 2 units, while a large one restores 10 units. You begin the game with 2 extra lives. However, you can earn more by finding and collecting these 1-Up icons. Some are placed in predetermined locations throughout various stages, while others are dropped very infrequently by defeated enemies. Those left behind by enemies won't stick around long, so pick them up before they disappear. An Energy Tank will give you the opportunity to restore all of Mega Man's health at any time of your choosing. You can store up to four of them at any time. They are quite rare, so it's important to save them for special occasions. See below for more information. Energy tanks, or E-tanks, are very useful items, but you must use good judgment on when to use them. Obviously, you should use them when Mega Man's energy is very low and he is about to die, but not too early. If you use them too early, you might end up using up a tank when you could have survived. However, the price for waiting too long to use them is one of your lives. And you'll need them near the end of the game when you're getting close to Dr. Wily. Throughout the game, you will defeat certain Robot Masters who not only provide you with their special weapon, but also give Dr. Light enough time to complete helpful projects that he's always working on to give Mega Man some assistance. Upon receiving these special items, you can select them as you would any other weapon. Once deployed, these items either use up energy every time you create an item, or while the item is in use. This energy can be restored by using a weapon power item, just like restoring any other special weapon. Received after defeating Heat Man. This item creates a small platform which slowly rises to the top of the screen while it remains active. You can create up to three of them on the screen at one time. They float a short distance before beginning to blink, indicating that they are about to disappear. Energy gets used up every time a platform is created. Use these platforms to reach higher, out of the way platforms and ladders that Mega Man can't otherwise reach. Received after defeating Air Man. The second item is a jet fueled hover board. Once deployed, Mega Man has only a split moment to jump on board before it launches in a straight direction. You cannot steer it in any way, and it does not stop until it hits a wall or other unmovable obstacle. It drains energy as it continues to fly, and will disappear the moment all of its energy is depleted. Received after defeating Flash Man. The third item is a little similar to the first item in that it creates a platform for Mega Man to stand and ride on. However, it requires a wall nearby to attach to, as it will not climb up thin air. 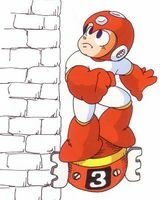 Additionally, it doesn't just rise, it can also descend, but it will only do so whenever Mega Man jumps off of the item, or when it reaches the top or bottom of the wall it's clinging to. It uses energy with each use, and will also blink before it disappears. This page was last edited on 1 February 2017, at 14:15. This page has been accessed 33,138 times.